What Index did I select for the comparison? 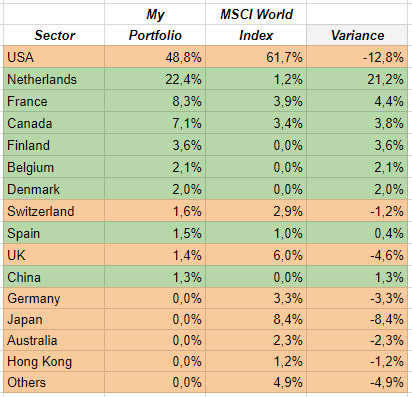 After doing some googling I decided to compare my portfolio with the MSCI World Index. The MSCI World Index has a broad exposure to a wide range of global companies within 23 developed countries. The MSCI World Index is only investing in developed countries so I’m still missing the emerging markets in my comparison, but I’m fine with that for now. Below is a table with the share in € in my portfolio per sector compared to the sector diversification of the stocks in the MSCI World Index. Real Estate did grow to 22% of my portfolio in 2018 vs only 2,9% in the MSCI World Index. At the begin of this year I have bought Real Estate Stocks various times due to a combination of decling prices as a result of the fear for rising interest rates. I increased my positions in Coresite Realty, Monmouth REIT, Simon Property Group, Wereldhave and WDP. I initiated a new position in Unibail-Rodamco (EPA:URW) to benefit from the pricedrop after they announced their bid for Westfield. I do believe that Real Estate stocks can take an above average share in a dividend portfolio, because in general Real Estate funds are good for a steady flow of dividend income, but I think in my portfolio the share of Real Estate is too high. 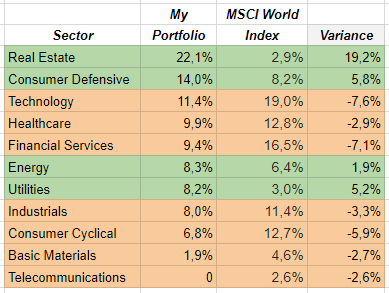 Consumer Defensive stocks are 14,2% of my portfolio versus 8,2% in the MSCI World Index. This is mainly due to investments in Unilever, Danone and Coca Cola. I’m fine with being overweighted in this sector. It are in general steady funds with a reliable dividend income which will not suffer to much in times of crisis. Technology is underweighted in my portfolio. Often Technology funds are not paying dividend or they have a low dividend yield. In my portfolio 3 largest technology shares are Apple, Alphabet and Facebook. I’m planning to increase the weighting of Technology shares in my portfolio by buying for example shares as Tencent (TCEHY) or NXP (NXPI), etc. I’m underweighted in this sector. My biggest positions are Aegon, Flow Traders and Royal Bank of Canada. Companies in this sector often have a decent dividend, but last few years I not often invested in banks or insurance companies due to the low interest which often results in low margins for Banks and Insurance companies. I probably keep this share of the Financial sector steady in my portfolio. I’m at a share of 8,2% versus 3,0% in the MSCI World Index. I only have 3 Utilities stocks in my portfolio with Fortum, Dominion Energy and National Grid. Fortum (CPH:FORTUM) is up 70% since I purchased this stock and this had a big influence on the sales share of the Utilities sector. I’m fine with being overweighted in Utilities. It brings in nice and steady dividends. I’m underweigted with a share of 6,8% in Consumer Cyclical shares versus 12,7% in the MSCI world index. I only have 3 Consumer Cyclical stocks in my portfolio: Amazon, McDonalds and LVMH. I wouldn’t mind increasing the sales share of this sector more in my portfolio, but I tend to invest in cyclical funds at times when the economy is in a recession. The sectors with a deviaton of less than 5% I don’t cover. I consider those deviations close enough to the index. I want to reduce my exposure to Real Estate. Probably I will reduce the exposure by investing in Consumer Defensive and Technology shares and not by selling shares. I also should analyse every 6 months how the share of the various sectors in my portfolio is developing so I stay aware of how my portfolio is developing. How is your portfolio looking? I’m curious if I’m the only one how is overweighted in sectors like Real Estate, Utilities and Consumer Defensive stocks. Let me the biggest sectors in your portfolio so I can compare it and see if it’s fine for a dividend portfolio to have some extra exposure to these sectors.